From there, my card was born. Sometimes I like the subtlety of a monochromatic card, but the pop of red in the room also caught my attention, so I added it as an accent. Cardstock: CTMH, PTI; Stamps: CTMH, Verve (sentiment); Ink: CTMH, Memento Tuxedo Black; Cuttlebug embossing folder (dots, distressed stripes); Nestabilities classic rectangles, tag die; Fiskars threading water punch; Other: Ribbon, Waxy Flax, white gel pen, red rhinestones, sanding block. 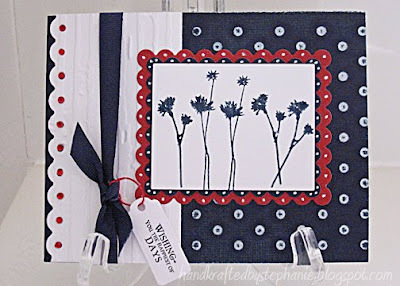 Beautiful card, Stephanie! I love all those dots!